Rachel Taylor reports on her first multi-discipline event. Triathlon has experienced something of a purple patch in recent years, and there is little sign of the attraction starting to wane. Duathlon, too, is growing in popularity. From what I can work out, the duathlon season is largely seen as a precursor to the triathlon season: a chance to test out how winter training has gone, and to become ‘race sharp’ in readiness for the triathlon season itself. For me, however, duathlon seemed to be a good way to dip my toe in the water of multi-discipline events – all the more so as it would not require any actual foot-wetting. Don’t get me wrong: I can swim. I enjoy being in the water and, push come to shove, I have splashed up and down the lanes of a pool to knock out a paltry number of lengths. For me, however, swimming is not an effective means of covering any distance. Focusing on the absence of swimming, and the feeling of relief this brought me, I blithely signed up. One of the first differences I noticed from your common-or-garden running race was the need either to be a member of British Triathlon or to purchase a day’s race licence. Having to buy a licence (for the princely sum of £4), and acquiring the insurance which it included, made things seem quite, well, scary. Not scary in the same way as the time I had to sign a disclaimer saying that I accepted that taking part in Endurun, the 24 hour race at Newcastle Racecourse, gave rise to a risk of serious injury or death. Scary in the way that it seemed ‘professional’ and I was (and still am) a rank amateur. Still, at this point the event itself was six and a half weeks away. Plenty of time to get some practice in and feel confident on the starting line, right? Plus, between now and then there was the small matter of the 14 (ahem) mile Kielder Dark Skies run to complete (for more on that see the excellent race report from Vicki Deritis). After that, surely the prospect of running 5km and then 2.5km, albeit interspersed with a 20km bike ride, should be something I could take in my stride, right? The answer, it turns out, is ‘sort of’. Training had been going well: my running was ticking along nicely, and my confidence was improving with it. I’d also got some decent rides in on the bike. I had even managed to go for a bike ride and then, straight after that, a short run. It felt like strong preparation for my first ever duathlon. And then man-flu struck. It was the kind where trying to breathe made me feel like I was a fish out of water, gulping to get air in with limited success, and where climbing the stairs at home left me breathless and in need of a sit down to deal with wobbly legs. Even I knew that going for a run was not an option. So I rested. I did no running for three days, and on the fourth I tried a steady, 2 mile flat run during which I quickly, but reluctantly, came to the conclusion that I wouldn’t be able to run the Good Friday relays the next day. The next ten days followed a similar pattern: resting for two days, trying a short, easy run on the third and realising things were getting marginally better but still weren’t right. Finally, on Friday 21 April, I managed to feel just about human as I finished a 3.4 miler, on the flat and at a steady pace. Given that the run routes at Stockton were pretty flat, and the pace I’d just run at wasn’t far off the steady goal race pace I’d mentally pencilled in for the runs there, I started to think I might just make it to the starting line after all. That then meant that it wasn’t until I was sat on the sofa on the night before the race that I started to think, for the first time, about the elusive extra discipline that is transition. I got a few wise words from the other half about transition: about stopping my Garmin as I came into transition and immediately starting it again to get a signal for the bike ride, and then doing the same thing again as I came in off the bike ready for the second run. I also got some tips about shoe placement (having the straps on the cycling shoes open, and the shoes ready to step into), helmet strap management (have the helmet upside down, with the straps wide open, so that it could be scooped up and strapped on in one fluid movement and, most importantly of all, making sure this was the first thing I did before touching the bike and the last thing done before setting off on the run), and positioning of trainers ready for the final lap. I realised there was a bit more to this than I’d let myself consider. It felt like cramming the night before an exam: a woeful, last-ditch attempt to feel some degree of preparedness but a poor substitute for having practiced for real. Time would tell whether it would be enough. The alarm went off after a surprisingly decent night’s sleep. Thankfully it wasn’t at too savage a time: I only needed to arrive in Stockton at around 9am. The drive down was a doddle, we were lucky to find a great parking spot near the race venue and, even better, it was free on a Sunday. Better still was the fact that I found a £1 coin in the ticket machine when I was checking whether we needed to pay to park, so that went straight to my charity fundraising efforts (which is why I was doing the duathlon in the first place): as a well known supermarket says, every little helps. Walking towards registration, the novice event was underway. The sprint event (in which I was taking part) was drafting legal, but this was only decided after people had already signed up. This meant that you couldn’t ride it on a bike with disc wheels and aero bars, so the organisers swapped those people who had such bikes into the novice event, along with people who had entered the novice event outright. I did know this, but it escaped my worried mind whilst walking to the start, and all I could think was that I’d bitten off more than I could chew: if such kitted-up, seasoned athletes had opted for the novice distance, why oh why had I gone for the longer ‘sprint’? Too late now, though! Time to take my medicine. We crossed a footbridge, with very handy bike ramps at the sides, and could hear some northern soul tunes drifting over from the start/finish areas. We dropped down into the central hub of the event and it quickly became apparent why it is called a ‘duathlon festival’: there are three events offering different distances, but more than that there were marquees dotted around, excellent catering outlets, and a generally relaxed, friendly vibe. It helped enormously that this was a glorious spring day: bright blue skies, barely a cloud and trees in glorious blossom. Much of this escaped me, of course, until after the finish. By now I was fully gripped by pre-race nerves and I walked around mumbling things like “I hate this and I’m never signing up for anything like this ever again”. You can imagine the look I shot the other half when he responded to my comment by saying “You can’t say that – you might actually enjoy it yet.”! Registration was a breeze: friendly faces and an efficient process. I also managed to help someone else who seemed even less familiar with things than I was – and that’s really saying something! It also brought with it a reminder that there were more rules and regulations than a normal running race: ladies had to put a yellow sticker on their bike helmet above their right ear because, whilst drafting was allowed, a competitor could only draft people of the same gender. Time penalties would be incurred for an infraction of this rule and ultimately, for repeated transgressions, disqualification would result. Gulp: something else to remember. To get into the transition area to rack your bike you had to have your helmet on, and your bike checked by an official. The guy doing this was cheery and helpful, and pretty efficient. You then had to go through security, to check that the number on your bike and bib matched. Once into the transition area I took some time finding my spot. I was hugely fortunate: my place on the rack was the far left-hand corner, about 20 bikes in from a lamp-post. Even I felt confident that this should be relatively easy to find coming in from the first run, and I started to relax a little. Bike racked, shoes set out, helmet positioned, I came back out of transition and wandered around waiting for time to pass. Before too much longer we were all making our way to the (closed) dual carriageway to mill around waiting for the pre-race briefing. As pre-race briefings go, it was pretty good. It was clearly audible, gave a clear and concise explanation of the main rules, and it was welcoming: they acknowledged that for many people there it would be their first attempt at any multi-discipline event. This eased my nerves a little: for all it was a World and European qualifying race at the front end of the field, there was still a place for little old me, albeit much closer to the tail-end of said field. And then we were off. As is always the way with a mass start, it’s tempting to get carried away with adrenaline and rush off with the crowd. I paid extra attention to avoiding this temptation given the restricted training I’d managed in recent weeks due to illness, and the fact that the temperature was much warmer than in recent weeks. The run was, as promised, largely flat. From memory, the only real climb was onto the Millennium Bridge and even then it was a strange combination of ramps and then flats, so pretty kind all in all, and certainly far kinder than the bridge itself, which swayed horribly whilst I was running over it. Once down off the bridge, there was a flat, straight section heading towards transition. 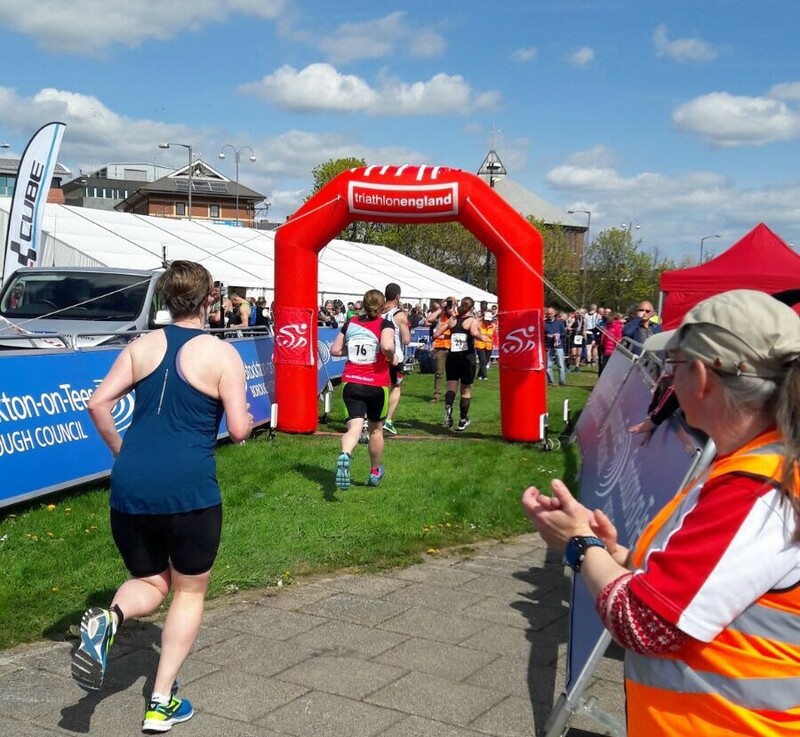 One of the best bits of advice I was given prior to the event was to avoid the runner’s temptation of seeing the finishing line and putting in a spurt. I checked the natural temptation as it arose, and crossed the line into transition in better nick than I would otherwise have done, remembering to stop my watch and start it looking for a signal again. I also felt fairly calm, and managed to find my bike with ease (thanks in no small part to the kind placement of my spot). Helmet on, sunglasses on, trainers off, cycling shoes on, bike off the rack and away I hobbled out of transition, like an arthritic penguin walking on hot coals: the cleats certainly help on the bike but off it, it’s a different story. Along with the rules on drafting, the key thing for me to remember on the bike was that I had to complete three laps and count them myself. Lap number 1 was familiarising myself with the route. The course was fairly technical in that it involved a number of tight 360 degree turns. I was grateful that it was a dry day, and that, by virtue of having taken the run pretty steady, I wasn’t jostling (or being jostled) for position on the road. About three quarters of the way around lap 1 came a timely reminder of the dangers of drafting and tight corners: a marshall was on a roundabout flagging for people to move into the right hand lane, so as to avoid the pile of bodies and bikes (about 4 or 5, I think) strewn on the left hand lane. Plenty of people were there helping, and the riders were in the ‘walking wounded’ category, but it’s not a sight that anyone wants to see in such an event. The beauty of a lapped course is that it is great for spectators. It was also great for me to be able to get some support a couple of times on each lap. It was also really useful because after lap 1, I got a better sense of where to put effort in, where an uphill segment was rewarded shortly afterwards with a downhill, and generally the better lines to take over roundabouts and corners. Lap three done (and I knew it was lap three, because as I making my way around I was mumbling the lap numbers to myself!) I pulled back into transition, making sure to dismount before the dismount line. Forget anything you’ve ever seen on TV, where people undo their shoes whilst on the bike, and then gracefully dismount on the line itself and seamlessly launch into an elegant trot. I clipped out, ground to a halt about a metre from the line and then started a curious walk-trot (think like those ladies you see on Crufts) towards my rack. Again, I found it in a timely fashion, and set about the transition rigmarole. This time, however, it was a bit more difficult. Firstly, my legs, whilst still feeling strong on the bike, felt anything but strong now they were back in contact with the ground. Secondly, my fingers weren’t working very well, meaning that I really regretted not putting in the second tri-lace. I’d fitted one to my trainers a few weeks ago, testing it out to see if it was comfortable to run in and easy to use. It was on both counts. I just never got around to fitting the second one, something I was cursing as it took three attempts to tie my right shoe to a passably tight level. Anyway, thankfully the fingers still worked well enough to unclip the helmet (I have heard stories of people who have ended up doing the second run still in helmet!) and it was out I went for the second run. Cardio-wise, it felt good, and my watch was telling me I was hitting the modest times I had set out for. 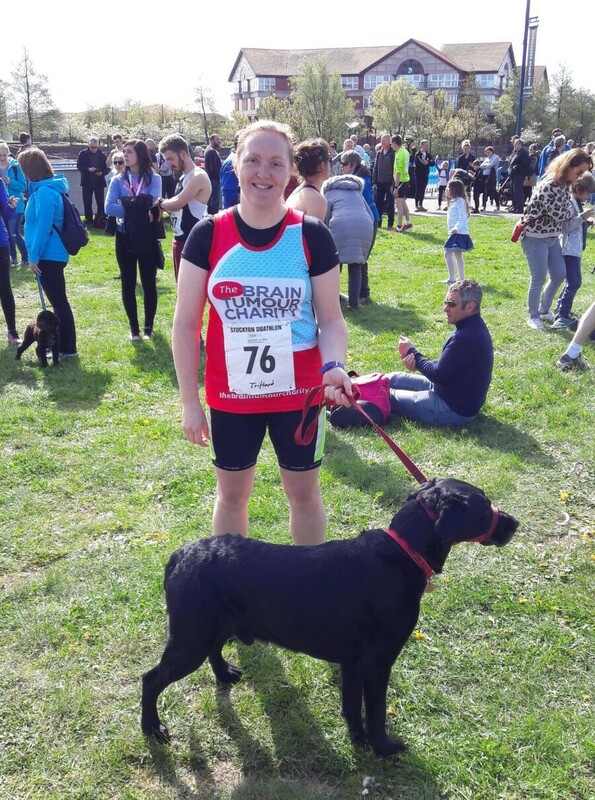 As it happens, I didn’t drop off from the pace of my first run at all – maybe because I took that one steady – but I took that as a positive as I trotted around. The feedback I was getting from my legs, however, was a different story. They were telling me that they were made of a strange combination of jelly and lead, and I had to look at my reflection to reassure myself that, contrary to what my legs said, my knees still bent over my toes and not backwards underneath me like a T-rex. For the most part the run was flat, with three exceptions on this route. The first was a twisty incline to take you back over the Infinity Bridge. It felt like Alpe D’Huez, but the marshalls there were incredibly encouraging. The second was a set of steps to get up. Again, really well marshalled, but the steps were very shallow and it was impossible to run up them whilst sticking to a sensible rhythm. The third and final one was, again, the ramp-and-flat section up to the Millennium Bridge. Going over bridge, the swaying felt even worse this time given the wobbly state of my legs: I felt pretty queasy going over it and was really glad to be on the ramps down towards the flat, home straight. Rachel (No 76) finishing the race. I crossed the line, stopped my watch and felt pretty pleased I’d got around. I was even more pleased that there was a volunteer who had crouched down to remove my timing chip. I’m pretty sure that my legs wouldn’t have been happy with me trying to crouch and stand up again. My relief was short lived as I heard my name being announced over the tannoy, and then a man thrust a microphone towards me. On signing up to the event, in the section headed “tell us an interesting fact about you”, I must have mentioned the charity fundraising. Had I thought it would result in an impromptu, finishing line interview, I would not have done. I did my best to listen to his questions, give answers that hopefully made sense and were related to what he’d asked but, in all honesty, I was just trying not to sound out of breath: I didn’t want my media debut to be some sort of heavy breathing fiasco. I retrieved by bike and other kit from transition, showing my race bib to match the number on my bike, and finally sat down to enjoy a post-race coffee and ice-cream in the sun. I allowed myself to be pretty chuffed with getting around the course and having fun whilst doing so. Would I do another? Yes, I would. Duathlons are pretty good fun, really. 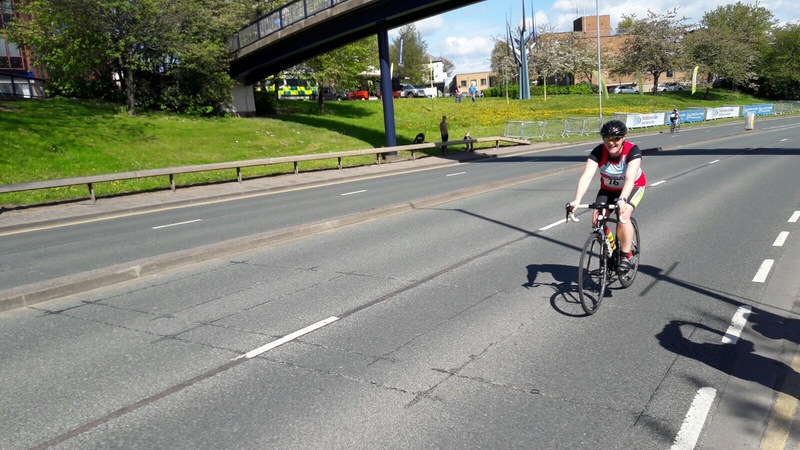 Stockton is a really friendly one, super well organised, the roads are closed for the bike route and I could recommend it without hesitation. Transition is really quite important. I felt calm, and I thought I was pretty slick. The print-out with the breakdowns of my times shows I have a lot to learn! There were no disaster moments, but there are people who finished ahead of me on overall time simply because they had better transitions: I was faster than them on the bike, and both runs. Practice makes perfect: for my first effort, I am pleasantly surprised, but (if there’s a) next time I’d practice to be quicker. Just because you don’t get the training you hope for doesn’t mean the event is a write off: I salvaged something I am pretty pleased with, all things considered.